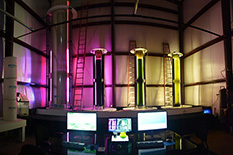 Pictured: Dayton, Md.-based HY-TEK Bio's algae-based system for removing greenhouse gas from emissions created when burning fossil fuels. The pictured tanks are fully operational at the Back River Wastewater Treatment Plant in Baltimore, Md. The company's MIPS grant teams it with the Institute of Marine and Environmental Technology to evaluate two poultry manure-to-energy processes, as well as each system's efficacy when combined with HY-TEK Bio's greenhouse gas-scrubbing system. Photo courtesy of HY-TEK Bio. The Maryland Industrial Partnerships (MIPS) program, an initiative of the Maryland Technology Enterprise Institute (Mtech) in the A. James Clark School of Engineering at the University of Maryland, has approved research projects worth $4.7 million to 18 teams combining Maryland companies with state university researchers to bring technology products closer to market, program officials announce today. A technology acceleration program, MIPS grants money—matched with company funds—to faculty engaged in each project. For this round of funding, companies are contributing $2.4 million and MIPS $2.3 million to the jointly funded projects. The Maryland Department of Natural Resources and the Environmental Protection Agency provided additional funding. Five projects, worth $1.9 million, are investigating various processes for converting poultry manure to energy, including anaerobic digestion, gasification, combustion and washing, while keeping the nitrogen and phosphorous in poultry litter from polluting the Chesapeake Bay. Each would potentially produce electricity and heat, while some create additional salable byproducts, such as fertilizer, soil amendments or algae feedstock. The additional 13 projects cover a broad swath of technologies, including: medical devices for brain scanning and pressure sensing; therapeutics for cancer, pain management and lung scarring; software for healthcare management, quality assurance for radiation therapy machines, and complex business documents; mobile-ready chemical sensors; high-quality prototype manufacturing; solid oxide fuel cells; and a natural, high-protein sports recovery milk. This round of funding connects faculty with 16 startups and two small companies. Five projects involve companies based in the Baltimore area, while four are from Montgomery County and three are from Howard County; two are from Annapolis, two are from Maryland's Eastern Shore and one each are from College Park and Keedysville. ($134,999) Sergei Atamas, associate professor, department of medicine, works with Baltimore-based SAJE Pharma LLC to conduct pre-clinical trial testing of the company's therapeutic for lung scarring, also called pulmonary fibrosis. ($149,550) Man-Kyo Chung, assistant professor, school of dentistry, works with Baltimore-based Centrexion Corporation to improve the company's capsaicin pain therapeutic, based on an ingredient found in hot peppers, which studies have shown block pain associated with osteoarthritis for weeks to months after a single injection. ($244,499) Steven Fletcher, assistant professor, school of pharmacy, works with Gaithersburg-based ConverGene LLC to design and synthesize drug candidates for a protein the company has identified as a strong potential cancer therapeutic. ($174,020) Mark Smith, associate professor, department of diagnostic radiology and nuclear medicine, works with Rockville-based Brain Biosciences Inc. to develop and validate a motion-compensation system for the company's portable brain positron emission tomography (PET) scanner. This technology will improve the quality of brain PET images in patients who are unable to remain still for the duration of a scan. ($182,580) Byongyong Yi, professor, department of radiation oncology, works with Baltimore-based JPLC Associates LLC to extend the capabilities of the company's Raven QA product, a unified and comprehensive quality assurance system for radiation therapy machines. ($629,500) Lee Blaney, assistant professor, department of chemical, biochemical and environmental engineering, works with Frederick based Triea Systems LLC to accelerate the development and commercialization of the company's Quick Wash (QW) process, which physically removes and recovers phosphorus from animal manure (including poultry manure), reducing phosphorus loading into the Chesapeake Bay and creating three high-value by-products. ($228,568) Tony Farquhar, associate professor, department of mechanical engineering, works with Catonsville-based Potomac Photonics Inc. to help the company increase its manufacturing capacity for hot-embossing 3D patterns into thermoplastic parts, which the company calls high-quality prototyping, for use in microfluidic devices that quantify or manipulate cell-level biochemical phenomena. ($200,000) Tim Finin, professor, department of computer science and electrical engineering, works with Baltimore-based RedShred LLC to develop a semantically enhanced open information extraction software system that takes complex business documents, like grants and requests for proposals, quickly extracts important information, and offers users an efficient way to review opportunities with minimal manual intervention. ($334,999) Feng Chen, associate professor, Institute of Marine and Environmental Technology, works with Dayton-based HY-TEK Bio LLC to evaluate two poultry manure-to-energy processes, as well as each system's efficacy when combined with the company's algae-based system for removing greenhouse gas from emissions created when burning fossil fuels. ($308,995) Stephanie Lansing, assistant professor, department of environmental science and technology, works with Columbia-based The Crimson Group LLC to develop a system that gasifies poultry litter waste into energy. ($284,913) Stephanie Lansing, assistant professor, department of environmental science and technology, partners with Berlin-based Planet Found Energy Development LLC to develop a poultry manure-to-energy system that combines anaerobic digestion and a nutrient capture system to produce renewable energy and recover nitrogen from the poultry litter in the form of salable fertilizer. ($207,304) Mei-Ling Ting Lee, professor, department of epidemiology and biostatistics, partners with Annapolis-based Synaptic Advisory Partners to enhance the company's population health management software platform with an improved predictive model for identifying high-risk patients within a predetermined population. ($132,000) Thomas Murphy, professor, department of electrical and computer engineering and director, Institute for Research in Electronics and Applied Physics, works with Germantown-based N5 Sensors Inc. to develop a mobile-ready, chip-scale chemical sensor technology that can detect toxic gases such as benzene, carbon monoxide and ammonia in ambient air. ($478,700) Catherine Plaisant, senior research scientist, Human-Computer Interaction Lab (HCIL), University of Maryland Institute for Advanced Computer Studies, works with Annapolis-based Pulse8 Inc. to apply HCIL's interactive visualization technology (EventFlow) to Pulse8's healthcare data software to identify patient patterns in data and direct key components of the delivery system to contain cost and improve care. ($321,611) Jae Kun Shim, associate professor, department of kinesiology, teams with Keedysville-based Fluid Motion LLC to investigate the effects of 5th Quarter Fresh, a high-protein, fat-free chocolate milk, on post-exercise recovery and cumulative minor brain trauma. ($136,934) Eric Wachsman, director, University of Maryland Energy Research Center (UMERC), works with Fulton-based Redox Power Systems LLC to characterize the strength, performance and reliability of enhancements Redox is making to its solid oxide fuel cells. ($135,000) Miao Yu, associate professor, department of mechanical engineering and Institute for Systems Research, partners with College Park-based MedSense LLC to develop innovative, ultra-miniature fiber-optic pressure sensors for a wide range of applications in the medical industry. ($424,692) Jennifer Timmons, associate professor, department of agriculture, food, and resource sciences, teams with Salisbury-based AHPharma Energy Systems Inc. to develop a manure-to-energy, closed-loop geothermal heating system for poultry houses. Projects are subject to final contract negotiations. This is the 54th round of MIPS grants. The program has supported research projects with more than 500 different Maryland companies since 1987. Commercial products benefiting from MIPS have generated more than $28.1 billion in revenue, added more than 5,000 jobs to the state, and contributed to successful products such as Martek Biosciences’ nutritional oils, Hughes Communications’ HughesNet™, MedImmune’s Synagis®, and Black & Decker’s Bullet® Speed Tip Masonry Drill Bit, WellDoc's mobile diabetes management platform, and CSA Medical's diseased-tissue ablation platform. For information about the historical economic impact of the MIPS program, an independent study titled "An Analysis of the Impacts of MIPS Program Spending and the Commercialization of MIPS Funded Projects on the State of Maryland," by Richard Clinch, from the Jacob France Institute at the University of Baltimore, is available online.